While I'm not a fan of all board games, I do tend to appreciate some of them, especially those with a horror or sci-fi theme, and definitely those that utilize miniature models. 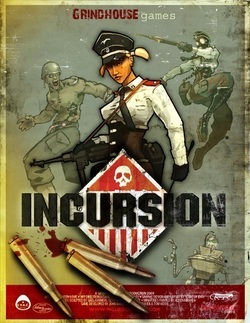 Therefore Incursion has been on my radar for quite some time now, because it incorporates horror and sci-fi themes with an alternate universe WWII setting. Grindhouse Games is made up of the same two brother development crew (Jim and John Bailey) responsible for the weird WWII alternate universe game Secrets of the Third Reich (SOTR). Secrets of the Third Reich is also filled with zombies, werewolves, vampires, and other hellish occult-like creations, right along side US, British, Soviet and German Nazi forces. 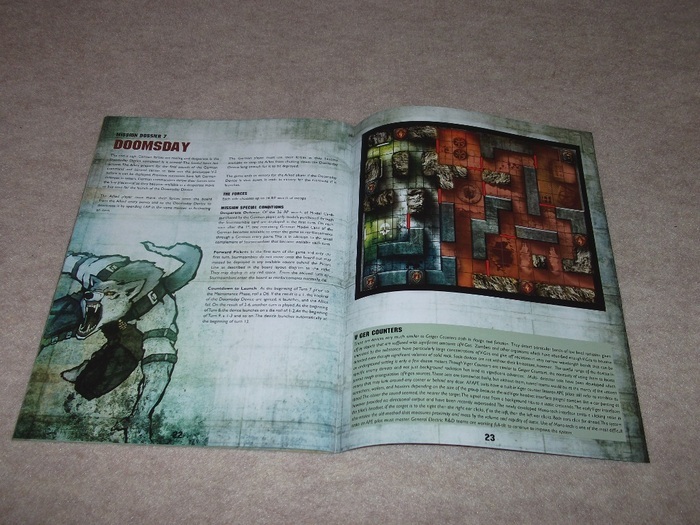 It's very similar to Darkson Designs AE WWII, only I think SOTR has even more monster types, and a much more robust range of models available for it via West Wind Productions in the UK. 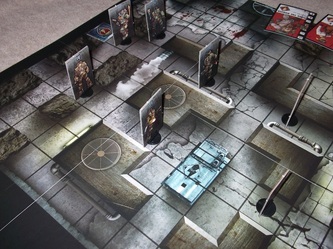 The rest of the Grindhouse Games crew is quite capable too, as they also have Agis Neugebauer who developed Battlefield Evolution for Mongoose Publishing on-hand, and miniature sculptor Seth Nash around as well who's previous accomplishments include having once worked for Hasslefree, The Assault Group and Enigma Miniatures. 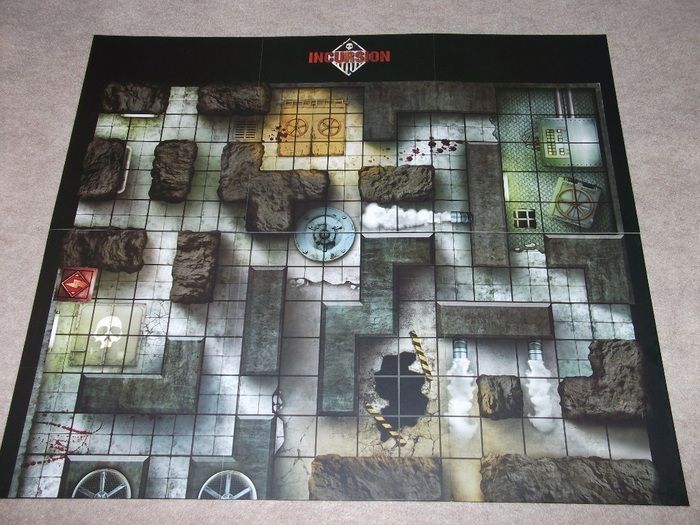 Now that you have an idea of what SOTR is all about, Incursion is a board game set within the SOTR universe. 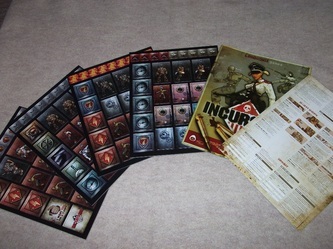 At a glance Incursion probably has a lot more in common with Tannhauser from Fantasy Flight Games than any other product out there at present. The big difference is, Incursion doesn't come with miniature models, but there are miniature models available to play it with (more on this later). The overall theme is very similar to Tannhauser, because this is an alternate universe where WWII lasts far longer than it actually did (it's 1949 in Incursion), and the Germans fool around with the occult and bio-experimentation, and the Allied forces employ some weird and powerful technology of their own, based on what they uncovered in the Roswell crash. Therefore Incursion and Tannhauser both look and feel a lot like a board game set within iD Software's Wolfenstien 3D game setting as well. 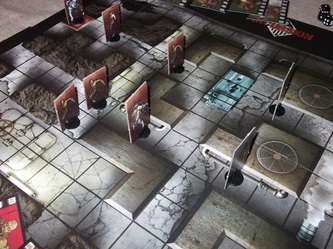 In the box you'll find four sheets of cardboard counters and models to punch out, 2x decks of Battle cards/profile cards, 3x six sided dice (D6), a baggie full of plastic stands for the cardboard models, the two-sided folded playing board, the rulebook and quick reference card. I do have one tip. You might want to use a hobby knife to poke through the lines where the counters/models break free, because it can be a little difficult getting the pieces punched free, even though they are pre-cut. The box itself seems sturdy, and in the bottom there's a plastic tray with compartments for the card decks, dice and all of the cardboard bits once they've been liberated. 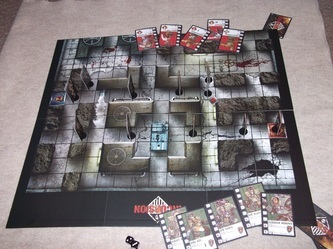 While this is a board game, it plays out more like a skirmish game from the wargames category, more than that of a traditional board game. 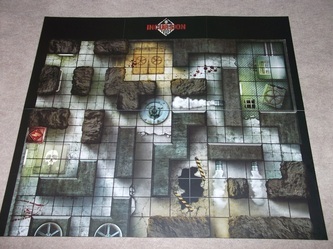 The board is roughly 2ft X 2ft square-ish (22 inches X 25.5 inches), and is printed on both sides. If you had two of the boards, you could create a larger playing surface, as it appears the other side of the map, is a continuation of the flip side. You create your forces in Incursion by spending Requisition Points (RP), as each character has a specific Requisition Point cost to include them in your force. How many RP given to each side to spend on a force is determined by which of the seven included missions you decide to play. The first mission is an intro game somewhat since each side is given just 6 RP to use, and for the Germans all 6 RP has to be spent on Sturmzombies. This pretty much leaves the US player with 2 models to work with. The last mission called Doomsday grants a whopping 26 RP to each side to spend, which is a bit too much if you ask me. I'd say that on average 10-14 RP per side makes for a standard size game of Incursion. The forces presented in Incursion are the US Lucky Seventh, and the German SWD (Special Weapons Development). The US troops are armed with APEs (Armored Personal Exo-Systems), which are rather large mechanized suits of power-armor. There's a grunt APE, HMG Ape, Ape Blazer (flame thrower armed), and APE Sarge (armed with LMG and grenade launcher) and Slugger Murphy who's also in APE armor, but carries a revolver called Bambi, and a baseball bat he calls Thumper. The German side include Sturmzombies, Bomberzombies, Blitzhunds, Hans the Hunter and the Von X sisters Ilsa and Gretel Von X. The Bomberzombies are rather scary, because they have surgically implanted naval mines in their gut, which make them effectively undead suicide bombers. The Blitzhound is a were-hound of some sort, who's quite formidable in hand-2-hand. So the Nazis are a colorful bunch to say the least. The game itself is played out in two phases essentially, the Maintenance Phase and the Action Phase. You replenish your Command Points and Battle Card hand during the Maintenance phase each turn, and everything else is played out via the Action Phase. To setup a game you first choose a Mission Dossier and proceed to lay out the game-board based on it. The Requisition Points you have to start with is then used to create a force. After that it's time for the Maintenance Phase, and after replenishing CP and Battle Cards during it you bid for who goes first using CP. Each player writes down how many CP they want to bid, and reveal simultaneously to each other what they bid. The one who bid more goes first, and the looser still looses those CP. Although the Allied side has the advantage in the case of a tie, because if there's a tie the Allied player always goes first. Each models profile card details how many Action Points (AP) they are allowed per turn. The cost for AP is 1 AP to move 1 square forward, 2 AP to move sideways or back 1 square, 1 AP to change facing 180-degrees, 1 AP to fire a weapon, 2 AP to fire a flamethrower or grenade-launcher, 2 AP to toss a grenade, 1 AP for a Hand-2-Hand (H2H) attack, 1 AP to open/close a door and 1 AP to pickup/activate an item. Now any left over Command Points from the Maintenance Phase can now be converted into additional AP to be used by any models in your command. The left over CP can also be used to kill a Battle Card played by an opponent. The Battle Cards also come as Event Cards and Effect Cards, all of which can be played at any time during the owing players' Action Phase. These cards usually boost a models stats via a temporary bonus, or grant extra AP or CP, all depending on what the card says. Each character profile card shows how many Fortitude (defensive value essentially) and Damage Points (wounds basically) they have. Combat is quite simple. To attack in H2H you roll a single D6 (called a Damage Dice or DD) for each attack you're making, at a cost of 1 AP per attack. Meet or exceed the Fortitude of the model, and you've hit them causing a Damage Point. Engaging in H2H also doesn't “lock” models in place as it does in most other skirmish/wargames, this I think keeps the game flowing smoother too. So the next turn both models who were in H2H on the previous turn can now move freely away from each other, or go at it again if they want. Ranged Combat is a little different, as you roll DD equal to the ROF (Rate of Fire) of the ranged weapon you want to fire, and compare each result to the Fortitude of the model your shooting. Meeting or exceeding the Fortitude value inflicts a DP to the model. At the end of a turn for a model with a ranged weapon, who doesn't end their turn with an enemy model in LOS, they can now go into Reaction Fire mode. This is essentially Overwatch mode in most other games, because now during the other players turn, if they walk into LOS of a model in Reaction Fire mode, they can be fired at with an Opportunity Fire. Each of the characters have their own Special Abilities that have an effect on gameplay too. If you have APE Sarge in your force, then you gain +1 AP per turn during the maintenance phase, and he can even allocate any of his own unused AP to any other allied model that hasn't yet activated. Gretel Von X has an ability called Zombie Controller which grants her 4x extra CP per game, to be used exclusively on Sturmzombies and Bomberzombies. The Bomberzombies pay 1 AP to detonate, and it's considered a grenade attack, and you add +3 DD to the roll for any models in the blast. 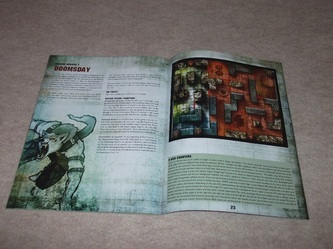 Also if a Bomberzombie becomes a casualty of a ranged attack you roll a D6. The result of this roll can detonate the model, kill it where it stands, or it can mimic the effects of a battle card call Blaze of Glory, causing further chaos and destruction. With the right Battle cards in your hand, you can further enhance the abilities of models, so it's quite an unpredictable game. 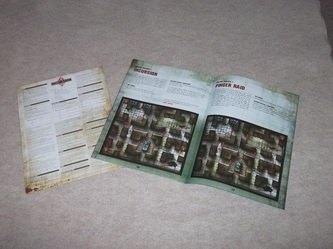 Lastly there's seven unique missions to play Incursion with included in the rulebook. With a little creativity tho, I see no reason why you couldn't whip up your own encounters as well. You can find a variety of player created content as well at the Incursion forums, found through the Incursion/Grindhouse Games website. Therefore there's definitely some solid replay value with this game. Incursion at first seems a lot like Tannhauser, but after you play it more, it becomes clear that Incursion is quite a bit more dynamic in play. The cards really do help to make it a bit more unpredictable overall. Looking at it strictly as a board game, Incursion is a fantastic board game, which plays out like a skirmish game, minus the 3D models. That's the one thing going against Incursion too. While the two-sided cardboard models are printed up nicely, and look good (gloss on the front side, matte finish on the other), nothing replaces a true 3D model better than a 3D model. 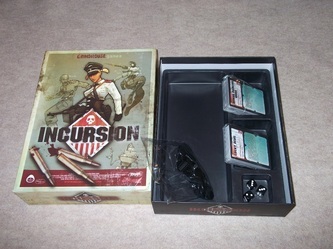 In their defense Grindhouse Games does make a line of Incursion miniatures, all of which can be purchased separately to play Incursion with, but they're optional. The models are all white metal, and you need to assemble and paint them yourself, but they're amazing models and well worth having if you plan to make a habit of playing Incursion. 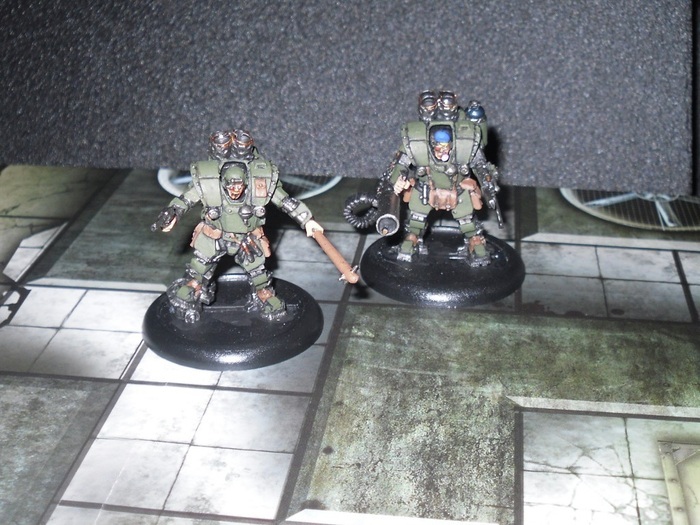 For more on them, be sure to check out my stand-alone review of the Incursion models. 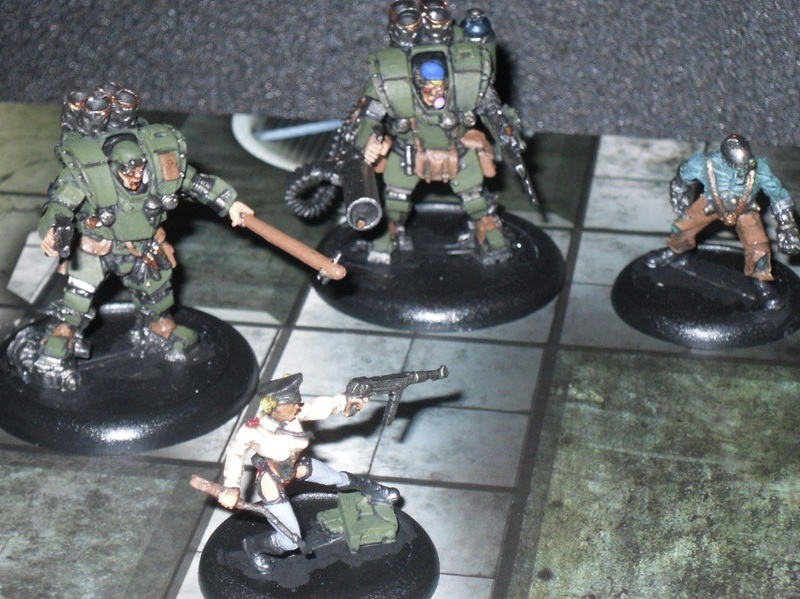 However the lack of models with the core game of Incursion is a bummer, and this is one area where Tannhauser jumps ahead of Incursion, because at least with it they include a nice variety of plastic pre-painted models. However, Incursion does cost less than Tannhauser, and If given a choice I'd prefer having the unpainted white metal models like they make for Incursion first and foremost, over any pre-painted plastic models. The game itself is great fun, even using just the two-sided cardboard models, but I find that it's even more fun using the Incursion minitature models made for the game. I've had the chance go assemble and paint up Slugger Murphy, HMG Ape, Gretel Von X and 2x Bomberzombies models, and they're quite exceptional models. They also make British Mi-13 models, which aren't represented in the core game, but are fairly new to the optional model line, and look equally as impressive as any of the other models available in the range. There's also a variety of resin terrain pieces available including doors and various bits of machinery to replace some of the cardboard bits, helping to turn this board game experience into more of a true 3D environment. If you enjoy Tannhauser, but are looking for something a wee bit different, that's less complex, yet still similar, then Incursion is definitely worth checking out. It's fast paced, and action packed, complete with zombies, were-dogs and lots of big gunz and mechanized power armor dudes. It also happens to look really good too. Grindhouse Games definitely get high marks for presentation, because Incursion is definitely right up there with Tannhauser in terms of production quality. It's a high production quality effort all the way, right down to the quick reference card, and manual. It's clear that Grindhouse Games took the high road with this project. What's more, at roughly $40 USD online it's priced quite reasonably, and you could easily spend that much elsewhere and have a whole lot less to show for it these days. Actually if you shop around, I've seen it for as low as $35 even. 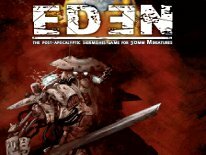 Editor's Note – It was brought to my attention as I finish this review for posting, that Grindhouse Games launched what they're calling Stupid Good Deals, which is two limited time offers on Incursion products, so that they can raise some extra cash to fund the next Grindhouse Games project. Stupid Good Sale #1 includes both the US and German starter sets of models (6+12 models), plus the Incursion board game boxed set for $100 USD! They also said that the first 25 people who jump on that deal will get an extra full set (all 6) sturmzombies, plus an extra set of Bomberzombies (2 models). Stupid Good Sale #2 includes the Incursion board game, plus 2x Sturmzombie models and a Gretel Von X model for just $30. 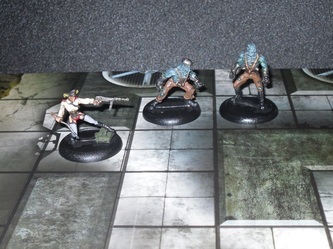 $30 for Incursion plus some models is truly a steal, and that's one deal that's hard to beat. If you're even remotely interested, those deals are only valid until October 2nd, so you might want to act fast, they won't be around very long.